Different emotions sprung up my head while researching stories of successful social media campaigns in mobilizing people for different causes. The research itself wasn’t really a hard task as I knew where to start at. Actually my memory saved me. It allowed me to remember that at the social media panel in Alexandria, Markmedia mentioned that he tweeted the exact question, and got many answers in no time. So, smart me, jumped on twitter, and *listened* to that lovely conversation. This is one of the things that I love about Twitter. It is its ability to help me find fast answers to my questions. While it may be hard to manage over Twitter, many web services appeared to give better structure for the questions/answers process. Mashable collected 5 of them in this informative post. You have to check it out, my favourite is to-answer. Tears escaped my eyes while scrolling the pages that talk about this heart wrenching massacre of a troubled young man who killed 32 people and wounded many others before committing suicide at Virginia Tech canvas. A huge number of people were mobilized online not only to organize prayers and pay tributes to the souls of the victims, but also to re-ignite the debate of gun politics in the US which prompted changes in the Virginia law of handguns purchase. Are schools in Virginia safer today? Probably yes, and probably not, but I salute people for taking action to make things change. 2. HSBC Interest Rate: I clapped my hands for the National Union of Students in the UK for standing up against the sudden unjust decision of HSBC bank to withdraw interest-free overdraft deal. Facebook was used heavily in what turned to be a very effective viral campaign that forced the bank to reverse its decision, acknowledge the service-oriented nature of its business and the power of Facebook to make their customer base voices heard. 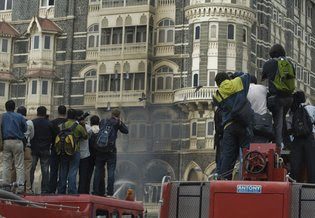 On 26 November 2008, and for 3 days in a row, the Indian people found themselves facing horrible attacks on different places in their financial capital – Mumbai -. With horror occupying the city, Indian people found themselves using their cell phones to report instantly the current news of events in which reigned Twitter at the helm of breaking news main source. Twitter has been used lately in different tragic events to report breaking news by people much faster than any other conventional media outlet. In fact, when a US Airways plane crashed in Hudson River earlier this year, news appeared on Twitter before CNN or Fox news mention anything – even on their websites. 4. Obama: Barack Obama broke traditional heritage of racism and discrimination and became the first black man to rule the United States of America. One can’t help but admire the way this man ran his brilliant online campaign; the way he mobilized people behind him for what he drew as a cause of an entire nation is purely amazing. His team mastered social media tools much better than his competitors which played a big role in helping him making history. I stand humbled by the powers social media opened for us ordinary people. These stories are human stories that came to life because of social media. Maybe sometimes people would face failures as in the case of the ‘Day of Anger’ in Egypt, and maybe some people do really feel trapped with the social obligations such medium impose on us, but the truth is that no one can deny the new form of communication social media opened have for us. Whether it is for our betterment or for our demise, it is us – people – who will decide.